Our Lady of Lourdes appeared to Bernadette in Lourdes, France. Read more here. 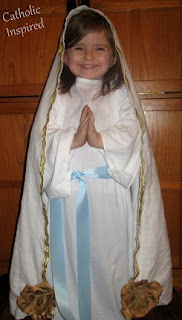 Our lovely little Lourdes lady is dressed in a white gown with a blue ribbon around her waste. Her veil is just a piece of white material. I sewed on a gold ribbon to the edge. I also sewed on a gold rose to each front/bottom corner. The roses were actually at Our Lady's feet, but I didn't think my daughter would like those on her shoes! ;-) My hubby spray painted a few yellow roses with gold paint to give them their golden color. Here is a large size. and they have them cheaper.